The Home Front Tea Room provides you with the opportunity to sample life in the 1940’s as seen in a typical tea room. The forties was a decade of great change. World War 2 shaped the first half of the forties as more and more men went off to war and women took up jobs such as the Land Army, working in factories and driving lorries, female roles previously unheard of. Children were evacuated to “safe” locations miles away from their homes and families. There was no time for decorating and supplies were short. As a result, many influences from the thirties, including the glorious Art Deco movement were carried over and influenced the 1940s interiors. One thing that was in relatively good supply was green paint! This became a dominant colour in 40s decorating, often offset with yellows and creams. After the war ended, a slow process of rebuilding started. Rationing persisted and money was short, but the great sense of camaraderie and community that had developed through the difficult war years carried on. Here at the Home Front tea Room we are celebrating the whole decade. Jolly 1940s music plays through our wireless (radio). The menu reflects food and drink items that would have been available in some form in the decade. Don’t worry; we have a 5 star food hygiene rating! Nothing is bought from the spiv or the dodgy butcher. The décor reflects the era with the expected bold green paint, some deco detailing and lots of 1940s furniture, ornaments and artefacts. The shop was purchased as an empty former charity shop and had previously been a record shop and host to many other trades. The building dates back to 1807 and the first floor is the only remaining part of a rather grand retail building. The larger section, to the left in the picture, was demolished to form a new fast food restaurant, now a large haberdashery shop. The downstairs tea room area was originally open to the elements, giving vehicular access to the rear of the premises! When we were handed the keys to the shop and opened the door for the first time, the décor was typical of a charity shop; slotted wall boards, carpet tiles and suspended ceiling with integral lighting. 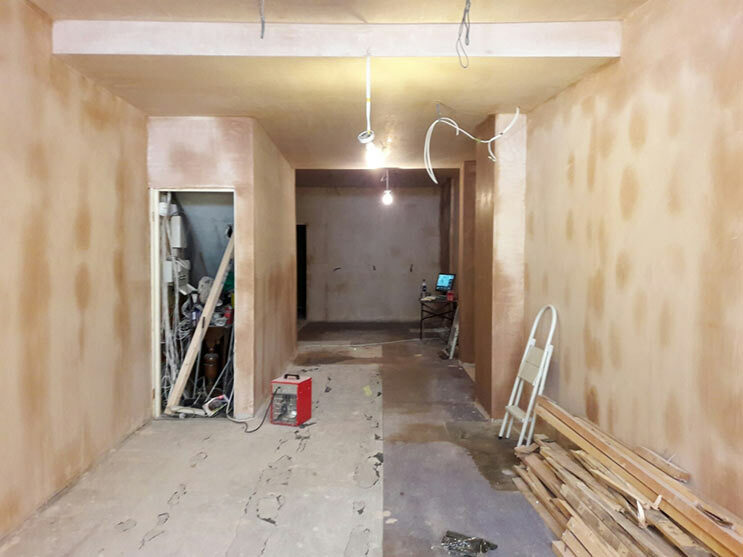 All surfaces were stripped back and we discovered that the walls were not even plastered underneath the shop display boards. The entire ground floor area was re-plastered and a new floor was laid. Decorating, including wallpapering, architraves, skirting boards, borders and dado rails were added. All electrical circuits were removed and replaced with new wiring and sympathetic fixtures and fittings. 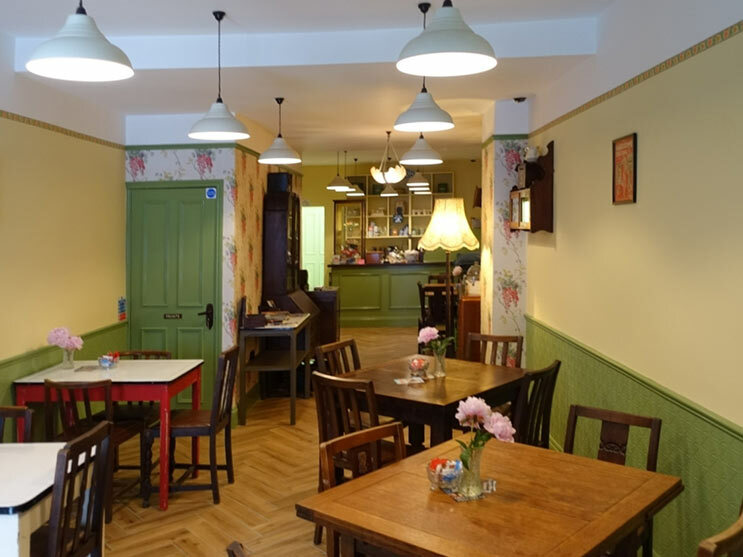 We hope you like the jolly atmosphere in the Home Front Tea Room and will visit us for tea, coffee, light bites or tasty treats. Throughout the 5 year project we always had a special friend in mind, Vernon Mee. Vernon worked in menswear and had a passion for vintage clothing. He gave talks on various subjects including Gentlemen’s Day wear and Beau Brummel to local clubs and societies. Vernon was a proud reenactor with an amazing attention to detail. 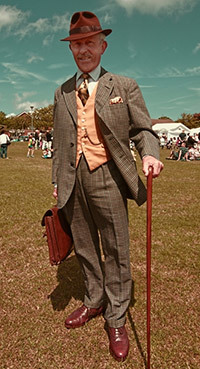 He was a regular participant in local events including Broadstairs Dickens Week and various 40s events. When buying various resources for the project we always said “yes, Vernon would approve”! Unfortunately Vernon passed-away in 2016 and wasn’t able to see the Home Front Tea Room completed. In his honour we have one of his fine coats, a hat and scarf hanging on “Vernon’s” special hook, with a small sign stating “Vernon Mee, Resident Chap”. 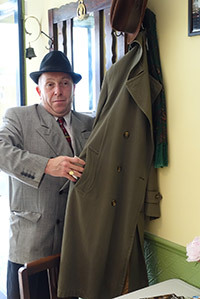 Here’s Adrian, Vernon’s son and an up-and-coming spiv, slipping something into Vernon’s coat pocket!